Sal peeped into the mouse cage. Dizzy didn’t come over for a stroke or even move a whisker, she just sat in the corner looking sad. “Oh, we don’t like that job,” said Sal. Sal sat on the settee for a moment and thought about how she loved to play with her mouse. She imagined not being able to lie on the floor and have her mouse crawl round her hair, and being able to hold it close and sniff its woffley nose. She sighed a big sigh. “I’m glad to hear it,” said her mum. She winked at Sal and swished her long blonde hair off her face as she tackled the washing up. Her big brown eyes filled with tears. Sal felt very ashamed. “Oh I don’t think it’s going to be a boy! Dad said if there was a boy and a girl mouse together, when they grew up they would soon have babies, and he said we didn’t want baby mice because we wouldn’t be able to find a home for them,” said Sal. “Then we could have lots of mice to to play with, YES!” said Sam punching the air with his fist. The two cleaned the cage out and after lunch they went to the pet shop with their mum. There was a young girl serving, she said the boss had gone out, and she would be in charge of selling the mice. She said they had just one black mouse at the moment. “We’d like the black mouse, as long as it’s a girl,” said Sal’s mum. The sales girl picked up the mouse and looked under its tail. I think that’s a girl,” she said. “Let’s take it, Mum, this might be our only chance to give Dizzy a friend,” said Sal. They took the mouse home and put it in with Dizzy, who got very excited and started running all over her cage and sniffing the new mouse, which Sam called Frederica, a girl’s name. The children were very pleased with their two mice. “Perhaps they will be a nice brown colour like we are,” said Sam. “Good idea,” said Mum, so that’s what they did. In what ways were the Dizzy and Frederico different? In what ways were Sal and Sam’s mum and dad different? What different races can you think of, or what skin colours can people have? Do all human beings have the same feelings? What are they? Do all people have the same needs? What are they? Ask any other suitable questions to educate the children about Bi-racial, or mixed race families. You might talk about the different races living in different parts of the world, and how over the years people travel to different countries and get married to people from those countries, and have children which look different from their parents because they are a mixture of two races. If you enjoyed this story please press the like button! My friend Wu was my hero. I just loved the way he was so bold and daring. He did things I did not have the courage to do. I was always afraid that someone might tell me off. I was afraid of tearing my clothes or getting dirty, or of trying anything new in case I could not do it well, and my parents would be disappointed in me. Wu’s parents had plenty of money but not much time, so they employed maidservants to look after Wu. Actually it was a string of maids that they had one after the other. These girls were very inexperienced in looking after children and they would just let Wu do what he wanted to do. He learned that if he screamed and shouted they would agree to let him do almost anything. Wu decided he was going to have his own circus. He set up a wire in his backyard with the help of the gardener. It wasn’t very high, just a few centimetres off the ground. He soon discovered that it was quite easy to balance on it and to walk along it. When he fell off it didn’t matter as the ground was very close. He told me I should have a go, but I was afraid as usual. It would have been easy enough but I didn’t want to get drawn into his tricks. Soon the gardener helped Wu to raise the wire a bit. It was as high as the seat of a stool now. He could still walk along it and if he fell off he had a safe way of falling, he said. I told him he should show his parents, they would be proud of him. Wu very much wanted his parents to care about what he did, so he started to dream up a plan. He didn’t think they would care for all his circus skills, his juggling, somersaults and high wire act. He decided to save his money and go on a train journey and then they would have to go and find him. They would have to take some time off work and go looking for him. He liked that idea. The maid laughed at his game and wrote his address down on a piece of card. Wu came to find me to take me with him on his journey. I refused to go. I thought it was a bad idea although I would have loved to have gone with him. I thought my parents would be too worried if I just went off. Wu disappeared. I ran to tell my grandma what had happened. She had heard so many things about what Wu had said he was going to do, but never did. She said, ‘Don’t worry Wang, he’ll be back for his supper.’ I was not so sure. That night Wu’s father came knocking at our door. ‘Is Wu here?’ he asked. It was unusual to see him, he usually sent the maid to our place to bring Wu back for his meals. ‘No, he came and told me he was off to Chengdu,’ I said. ‘You mean you let him go?’ said Wu’s father. ‘Wu has told us so many fanciful things about what he is going to do, I have never tried to stop him because he never does them anyway and because it’s not my place to stop him. It is his parents place – yours.’ Grandma replied. ‘That’s what he said, but I didn’t believe him, where would he get the money for a ticket?’ said my Grandma. Wu’s father rushed off. His wife had recently sacked the previous maid for stealing money. Perhaps Wu has been stealing the money. Much later Wu told me about what happened that day. He had set off on the train to Chengdu. People were curious about him. They all wanted to know where he was going. They said he was too young to travel alone. He told them he was going to stay with his uncle. ‘Where does your uncle live?’ asked a woman kindly. The whole carriage has been listening, they burst out laughing; some looked concerned, and some laughed cruelly . The kind woman asked Wu where he lived. He showed her the piece of card. They left the train at the next station and climbed onto one going in the opposite direction. Wu was relieved to see his own station, a place he recognised from meeting his father when he had been away. They started to move through the crowds. ‘ Wu!’ He heard his father’s voice shouting his name. Well, he went home with his father, the kind lady disappeared, and Wu cried all the way home. His father did not know what to say but gradually the whole story came out and Wu’s parents realised that their son was brave and clever, but needed more of their time and attention. He needed their guidance about telling the truth and about stealing. He needed to know about having a good reputation, or a bad one. His parents had to explain that if you do things which give you a bad reputation people will not trust you. They may not believe what you say when it is really true. You may find yourself in danger, as Wu nearly did. He needed to know that they appreciated his skills that he worked so hard at. Everyone needs praise and guidance when they are growing up. His grandma came to stay a while so that the family could sort themselves out. Why did Wu want to make the journey to Chengdu? Did he tell anyone he was going? Why did they not believe him? What did Wu’s father realise when he found Wu at the station. What things had Wu done that you would not do? What do children need from their parents and carers? Monkey Story 2 ‘The Visitors Arrive’, for kids of 6 to 8 years. A story about kindness and consideration towards newcomers. This story is ideal for children to turn into a play with some guidance from teachers or parents. Read the story to the children first and ask the questions posed at the end. Discuss with the children how they would like to act out the story and go ahead. The day the two new monkeys came along was a day to remember. All the young monkeys had their ideas about how helpful they were going to be, and how they were going to welcome their new visitors. When the visitors arrived there was something different about them. They had yellow tails. The monkeys eyed them up and down. ‘Who ever has a yellow tail?’ they thought . No monkeys had yellow tails in their tribe. They scurried round all checking their own tails. Brown. All Brown. Was there something wrong about the new monkeys? Why were they different? What else was different about them? Did they speak the same way? Did they eat the same food? Did they sleep at night? The young monkeys were puzzled. They had heard different monkeys jumping around in the trees before, but didn’t notice much about them. Now here were new monkeys who had lost their families and their tribe was being asked to be kind to them and make friends. One of the clever monkeys thought he would offer them some berries to show that he was friendly. Shyly the new monkeys ate the berries. Then the clever monkey made a long chattering sound and the new monkeys answered him with their own slightly different chatter. The clever monkey showed them his tail; he proudly waved it in front of them. One of the new monkeys jumped up on to a branch and seemed to fall straight off it. Just in time he curled his tail round the branch and hung downwards on it showing everyone what a clever tail he had too. The monkeys soon realised that although their new friends looked a little different from them, they still needed kindness and friendship, and in their turn they would be kind and friendly too. They fitted in very well with the monkey tribe and soon all the monkeys forgot about the differences between them, because those are the things that did not matter. Being kind and friendly and helping each other are what matters most. What would you call this story? How did the monkeys feel about having new visitors? How did the clever monkey make the new monkeys feel at home? What could the new monkey do with his tail? Even if monkeys or people are a bit different from us they are just the same inside, everyone, monkeys and people need what? The monkeys were having a meeting, they were making a lot of noise and jumping up and down. There were monkey mothers and monkey children and some old grey monkeys too. Nobody could hear what anybody was saying. 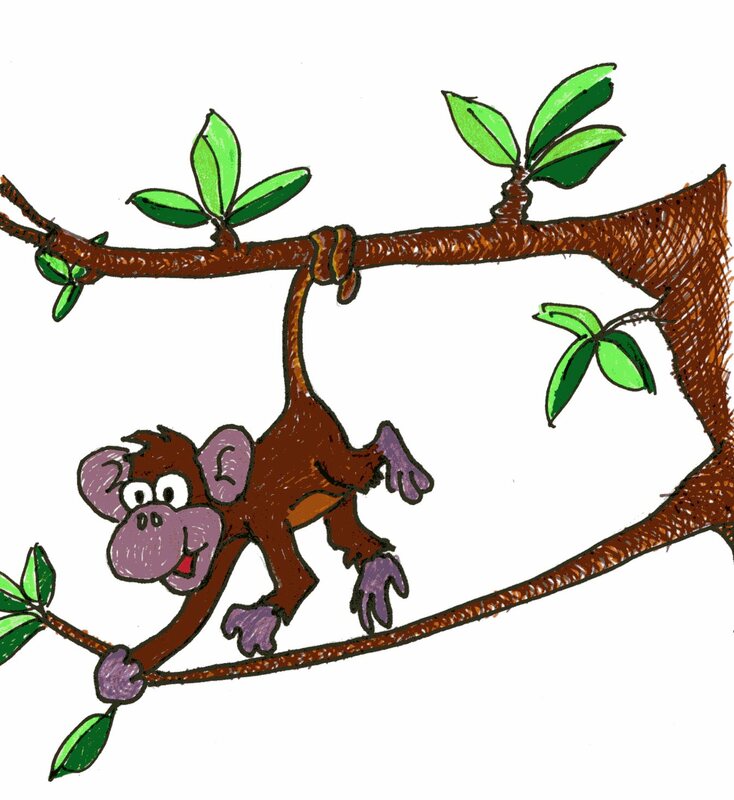 An old grey backed monkey stood and reached his big hand up to a tree branch. He shook it hard. All the leaves rattled and made a swishing noise. The baby monkeys ran to their mothers and hid. The boy and girl monkeys stopped jumping about and looked at the old grey monkey. They knew he was the leader of the tribe and that what he had to say was important. Monkeys who had been swinging about the branches clambered down to the ground to listen. Monkeys who were grooming each other stopped looking for bits and pieces to pick off their friends’ coats. All eyes were turned to Grey Back. ‘I can be a good friend,’ said one. ‘I can show them our food trees,’ said another. ‘I can help them to build a nest to sleep on at night,’ said a third. The monkey mothers nodded their heads in agreement. It seemed like the young monkeys had learned their lessons well. They had been taught to look after each other and to be helpful and kind. Grey Back gave the branch one last shake then lumbered off into the trees. ‘I’m off to find some fruit’ said a teenage monkey. ‘Fruit, fruit!’ whooped the youngsters as they all disappeared into the trees. What name would you give to this story – what do you think it is about? Why did the monkeys have a meeting? Why were two young monkeys coming to join the tribe? How did the monkeys say they would take care of the visitors? How would you look after new people in school? Does the story remind you of anything in your life? The child looked around her. She knew no one at all. Her brother has disappeared the previous day. He said he was going to look for water but never came back. She lay curled up on some rags she had found. Her body was tightly wound into a ball to keep warm. Hunger gnawed at her belly. Her mind was confused, no single thought formed properly. Emotions flooded through her. Shaking and trembling with cold, hunger and fear, she hid her face from the world. No one seemed to be interested anyway. She heard shouts and cries, the sounds of rough men and frightened women and children. Her mother cooked at the stove. The kitchen was bright and cheerful, colourful cloth draped the walls. She sat on her father’s knee and stroked his beard. Her elder brother was in the courtyard, she could hear his laughter as he played with his friends. Then suddenly fear came to stay. Planes high above, the sounds of explosions and screams, people running and nowhere to go. ‘What shall we do, my husband?’ asked her mother. ‘We shall wait, there is no place any safer than here,’ said her father. They gathered in the doorway and watched huge clouds of dust rising in the distance. Her brother flew indoors, aghast and horrified by the noise. A few minutes later the child found herself on the floor. The air was so thick with dust she could not see across the room. She reached out and felt the body of her father lying beside her, lifeless. Her mother too lay beside the stove, the small flames still sputtered, lighting the dust which gathered on every surface and on the bodies of her parents. She crawled across the room thinking it might be safer to stay low. Under the table cowered her brother, speechless and in shock. She wrapped her arms around him and they remained under the table until after what seemed like a very long time, the bombings stopped. Then shouts and cries filled the air, wails of sorrow and loss. Someone shouted their father’s name. The man pushed into the ruined kitchen, it was the neighbour, the girl gave a cry. They were all shepherded out of the ruined houses. She held tightly to her brother’s hand. He couldn’t seem to be able to speak. There on the rags, curled up, starving and thirsty she couldn’t recall the rest. She didn’t want to. She hoped to somehow get back in time and choose a better way forward, but young as she was she knew that it would not be possible. She felt a hand on her shoulder, it was gentle and kind like a mother’s hand. A young woman in clean clothing and with a badge in the shape of a Red Cross peered at her. She spoke words that were unfamiliar to her and offered her a bottle of water. Painfully the girl uncurled herself and taking the water drank deeply. The Red Cross women held her hand and helped her to stand. She felt so weak she could hardly put one foot in front of the other. She was carried to a lorry where a number of other children waited. They all had a bottle of water and a small loaf of bread. Most were silent, quietly nibbling their bread, their eyes hollow. She pushed the loaf they gave her under her clothes. She couldn’t eat. At a camp the children were put into tents, boys in boys tents, girls with girls. The older girls helped the younger ones to get what they needed – blankets, water and food. After a second long journey in a lorry they found themselves in a place where houses were still standing, where people were very poor but friendly, although they spoke a different tongue. She was taken in by a family which already had four children. There was a heavy stone in her heart, which seemed to get heavier each time she thought of her parents and her brother. She could tell no one about how she was feeling as her words were not understood. Meanwhile in the West people shook their heads in sorrow. A few signed cheques to help those in trouble. A few gathered up unwanted clothes and sent them off in lorries to Syria. A small number of brave, adventurous souls went to help in the camps, but most people did nothing. Some recalled the two World Wars when refugees were accepted, accommodated and cared for. But somehow ‘War Time’ was different. Then everyone had a personal investment in it. Families had members who were soldiers; many knew people who had lost their lives. Sacrifices were made and expected of everyone. The whole of Europe and most of the rest of the world was involved. People could empathise with the loss and sacrifice. Attitudes are different now. People have grown fat and rich and are afraid of giving up even a tiny bit of their wealth or their freedom to do exactly what they want to do for themselves. They think that they are not involved in this war in the Middle East. They think they can shut it out, shut the borders, close their eyes to it, refuse to recognise the suffering. Let other people in other countries, which happen to be closer but are not involved in the war, let them take the refugees. It doesn’t seem to matter to the West that many of these countries are very poor already, they are expected to share what little they do have with all the suffering and dispossessed peoples. Many people in countries in the West seems to be losing the ability to be generous and compassionate and instead focus on keeping what they have, come what may. It seems that the more they have the less they want to give. Is this the equality that is spoken about so loudly? It is time for a rethink. How do you see refugees? Are they guilty and need to be punished for being homeless? Looking back at your family history, or your friends’ families, how many of them have been persecuted for their race, religion, colour or nationality? Who helped them to get through and become happy and productive citizens? Does your heart go out to refugees when you hear about their suffering? Do you feel you would like to do something but cannot think how you could make a difference? How do your friends feel about the situation, are they selfish or generous? Does anyone express an opinion or do they just keep quiet and hope not to become involved? Could you afford to give something to the Red Cross or similar organisation that you trust to help these people. Could you raise some funds by holding an event, large or small, to show solidarity with those who are suffering? Is anyone in your town involved in this? How can you find out? You could let me know how you get on…. You know, being a dog is very interesting. Everything smells so different. You have to keep sniffing to see what’s been happening. You can tell a lot from sniffing. My human, she is called Katie, she can’t tell much from sniffing. In fact the only time I see her sniffing is when she’s sniffing me! She cuddles me and sniffs my head. I hear her telling her mum that I smell nice – sort of warm and fluffy. Poochie, that’s what they call me! My real name is Puccini! I am quite small for a dog. I can fit onto Katie’s lap and fall asleep and she just sits there stroking me. One day I saw a hole in the garden fence. I sniffed at it and smelt something different. I just had to squeeze through and look around . Katie saw me go. She screamed and shouted to her mother. What a terrible noise she made! I hid behind a bucket. I didn’t want to be with her if she was screaming. Poochie peeps through the hole in the fence, looking for treats. What was the little dog’s name in the story? How do dogs get to know what’s been happening around them? What did Poochie mean when he says that Katie was his human? What did Katy like to do Poochie when he was on her lap? How did Poochie’s nose get him into trouble? 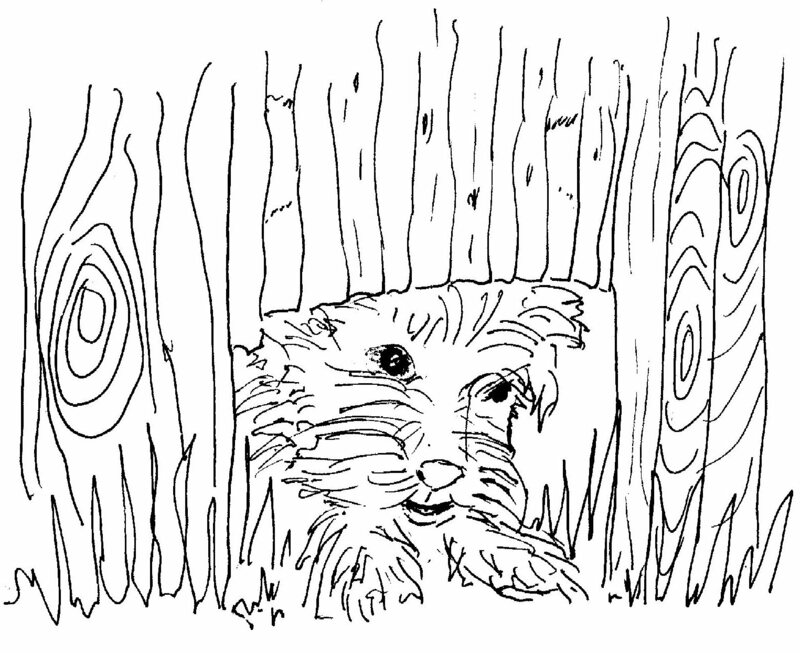 What did Katie do when Poochie disappeared through the fence? What did Poochie do when he heard her screaming and crying? What did Katie’s mum say when Katy was screaming and crying? Sometimes it is good to cry and shout and let your feelings out. Then when you have done it, you can stop and tell people who love you about your problem, and then you feel a bit better about it. In this story Katie’s mum came quickly to help, and that was when Katie needed to stop screaming and crying, so she did! One day Chloe’s mummy had to go to hospital to get her sore leg fixed. Chloe was upset when Mummy waved goodbye. ‘Who is Dr McPuffin?’ Chloe asked. Daddy showed Chloe a picture of Dr. McPuffin. ‘Goodbye Dr McPuffin, and thank you!’ they all say. ‘Why does he come into hospital and do that?’ asked Chloe. ‘I could thread some of those pretty beads for her couldn’t I?’ said Chloe. ‘And I’ll get her some nice flowers,’ said Daddy. Who was going to hospital? Daddy told Chloe about Dr McPuffin – what was he? What did Dr McPuffin do to make everyone happy? Have you ever seen a Puffin on TV? Where do they live? What did Chloe say she could do to make Mummy smile? What did Daddy say he would do? Who would be very helpful at home when Mummy came back from hospital? My name is Mark. I went to a small village school when I was a boy of your age. There were only 50 children in the whole school. Classes were small. We had the infants’ class, the middle-class and the top-class. My teacher was called Miss Tweedy. She was very kind. She noticed that every child was different. Some were shy and quiet and some were loud and confident and there were others in between. Miss Tweedy used to joke about herself and make us laugh when she made a mistake. Sometimes I thought she made mistakes on purpose just to make us feel better about ourselves when we messed something up. One day she came to school with an upside-down cake to share with the class who were the ‘winners of the month’. Every month one class was the winner. I did notice that we seemed to take it in turns to be the winner. It was called the ‘good behaviour prize’, and every month a different class won it, and shared out the cake between them. Sometimes it was chocolate cake and sometimes lemon cake. I used to like the cherry cake so if our class won I would always ask if we could have cherry cake for our prize. We always voted like that and sometimes I was lucky, but not always. I didn’t mind because I like chocolate cake and lemon cake too. I was telling you about the upside-down cake wasn’t I? Well, my class won the best behaviour prize, but we forgot to vote for what kind of cake to have. Miss Tweedy just got on and made one anyway. She asked the class if they had ever heard of upside-down cake. One of the girls put her hand up and said her grandma made it sometimes. Miss Tweedy took the lid off the tin and showed us the cake. I jumped up and down and clapped my hands. Cherries were gathered at the top of the cake, so many that there was hardly any yellow cake to be seen! Everyone giggled and shouted, they all liked cherry cake too. ‘Can you guess what happened?’ asked Miss Tweedy looking embarrassed, hanging her head and sucking her finger; I thought she was play acting but Sarah went up to Miss Tweedy and patted her arm. Delighted, we all sat round and had a piece of upside-down cherry cake. I turned mine the right way up to make sure it tasted as good as it usually did. Later on that day Timmy, one of the youngest in the class was writing some of his letters upside down. He was a shy, quiet boy and when Miss Tweedy showed him how to change them round he hung his head and sucked his finger and tears started to fall on his work. Timmy smiled and we all smiled, thinking about the taste of the delicious cherry cake and of how kind Miss Tweedy was. Why did Miss Tweedy turn her cake upside down? The cherries all sank to the bottom of the cake, so it looked prettier upside down. How did Miss Tweedy show that she was upset about her cherry cake? She hung her head and put her finger in her mouth. When little Timmy wrote his letters upside down, how did he feel about it? He was upset as he had made a mistake. What did Miss Tweedy say to make him feel better? She told him that we learn by making mistakes, and it’s OK to make mistakes. Frank is autistic. He loves puppies, but hates ‘Whitey’ the different pup. Hello I’m Frank. They say I’m autistic. I don’t know about that, I just know I’m not like other people and most of them do not understand me. There are a few kind people around who try to help, but mostly people move away from me. I think they don’t know what I’m going to do next. Sometimes I just have to shout and scream. The noise it starts deep inside me and then I just need to let it out and when I do I feel better for a while. Sometimes I want to bang my head on the wall to try to feel better. I don’t like doing that but the pain helps me to forget my feelings. The best thing I do is when I go and help to look after the dogs and puppies at a place near where I live. I like animals. Dogs, horses, even cows, but cows aren’t friendly so I don’t like them much. When I go to see the puppies there is one that I don’t like. It looks different from the rest. My favourite puppy is black and brown. 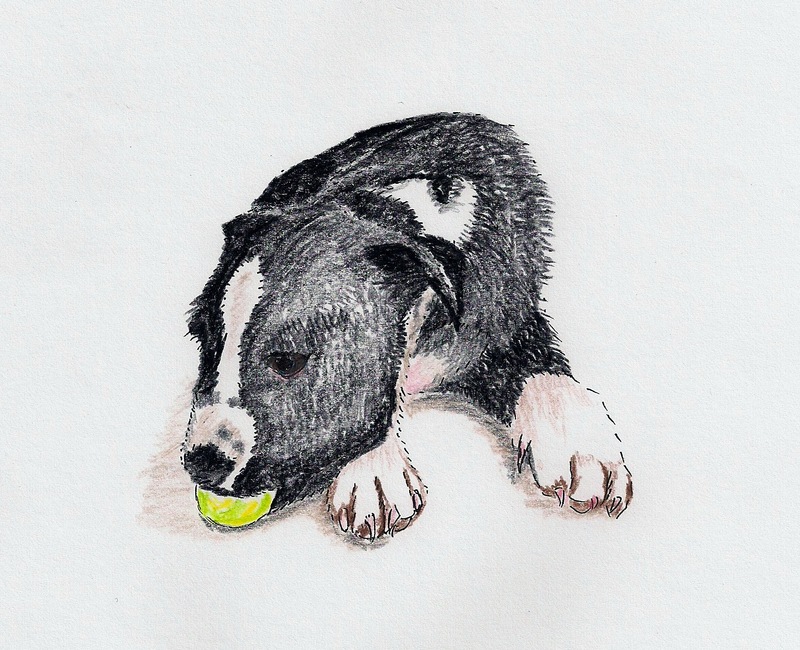 The puppy I hate is black and white. I think it is ugly, I wish it wasn’t there. I push it away if it comes near me and I like to make it frightened of me. My carer said that I must not be unkind to it. It is a dog that needs to be loved and cared for just like all the other dogs. She says I shouldn’t hate it. Every week one of the other puppies disappears. They said it found a new home. After several weeks the only puppy left is the one with white on it. I have no puppies to play with. I didn’t want to play with Whitey, but it wants to play with me. The owner said that she is keeping it because it is so pretty. I thought she thought it was ugly like I did. It was different, see? People who are different get called bad names sometimes, like I do. So I called that puppy bad names, and it made me feel strong, calling it names, like I am the boss, and I don’t want it near me, so I keep it away from me. But now it’s the only puppy left and it still wants to play with me. I feel lonely without all the other puppies. I wonder if it will play ball with me. I throw the ball and it brings the ball back to me. It’s wagging its tail. Perhaps it doesn’t care that I’m different. I stroke it and say ‘I’m sorry I was unkind to you.’ It licks me and I know it loves me. But if I shout at it or hit it , it will not love me, it will run away and I will lose my friend. I am not going to do that. What is the thing that Frank likes to do best? What kind of things could Frank do to help to look after the puppies? Does he like all the puppies? Why does he not like the black and white one? What does he do to Whitey at first? What does his carer say about Frank being unkind to the dog? Why did the other puppies go away? What did Frank think the owner thought about Whitey? What did Frank do to make himself feel like the boss? How did the puppy show that it liked Frank? What did Frank do to make friends with Whitey? Who was happy at the end of the story? Mary read the quote for the third time, or perhaps the fourth. She had never experienced depression and this quote seemed to be a taste of what it might be like. Her homework, to develop the idea in the quote, created a streak of rebellion. She looked back at her childhood. Her father would always march out of the room and do something else if a play or drama was about to be broadcast. In disgust he would depart. Mary tended to agree with her dad. What was the point of watching or reading about something that might give her nightmares? She preferred a light touch too. Certainly she wanted to be aware of the dark side of life, but not to be entertained by it. There are shades of black that she had no intention of ever exploring. Depravity and depression, disgust and decay, disillusionment and darkness, they all seemed to begin with a D and she wanted none of them. As she sat wondering what could be done with the quote, she became aware of two voices, one coming from each shoulder. There was a mean, harsh, nasty voice coming from the left side, and a soothing, serene voice on her right. ‘Call me Jock,’ said the mean one. ‘I suggest you don’t listen to him and you can call me Serena,’ said the other. Mary shuddered. Why would she want to see such things? At that moment the picture of the cool clear mountain cascade flashed through her inner screen. ‘Thanks, Serena,’ she said out loud. ‘Och away wi ye Miss Perfect Paws !’ growled Jock. Mary glanced to her right and saw to her surprise a contented looking feline washing her feet with great delicacy. ‘Serena?’ she queried. The cat merely turned her attention to cleaning her ears. The glimmerings of a blue flashing light, a body on the road and the sound of sirens started to impinge on Mary’s inner screen. ‘Get lost!’ she shouted out loud. Stern faces looked at Mary over their copies of ‘The Times’. She felt herself blush, ‘Oops, sorry. I got carried away with my book,’ she lied. She had completely lost track of her sense of place. She was in the public library reference section, where so many folk go to get a bit of peace or to do some writing or their homework. She stood up and placed herself between two long rows of bookshelves. If the dialogue between the entities on her left and her right shoulders was to continue she had to give them some privacy. A sense of peace settled over her as she thumbed through a copy of ‘Gardeners World’. A snowfall of white plumb blossom seemed to engulf her. ‘Thanks, Serena!’ she whispered, giggling at her success. She had no desire to view a road traffic accident just for fun. What kind of fun would that be anyway? She thought she heard the sound of splashing water. Puzzled, she looked about. It wasn’t raining outside and anyway there was a floor above her; she couldn’t be hearing rain. It became louder and the sensation of something like a shower curtain touched her face, she suddenly felt claustrophobic, then she saw the glint of metal, a blade piercing the curtain, a knife slicing downwards towards her. ‘Serena!’ she shouted out loud. Sounds of streaming shower water turned into a heavy, contented purr. The wet curtain morphed into the feel of warm fur, and the blade became a cats claw, gently withdrawing itself. ‘I’ve got to get out of here!’ she said to no one in particular. The librarian asked her if she was all right as she rushed past the desk. Outside Mary recalled a scene from the one and only horror film she had ever watched; it had preyed on her mind for years. ‘Now I know who Alfred Hitchcock * was listening to,’ she said. ‘You called?’ said a coarse Glaswegian voice. ‘No! Bu*ger off !’ shouted Mary. 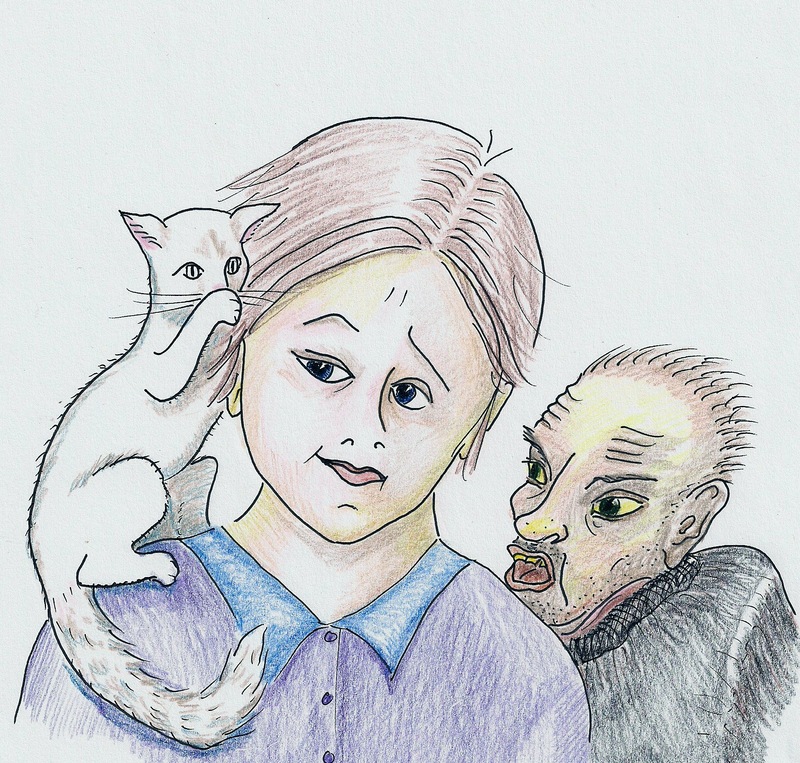 She saw the very slightest twitch of a cat’s tail on her right shoulder and then there was peace. * Alfred Hitchcock made horror films, in one of which, ‘Psycho’, the shower scene was shown. My grandfather used to tell us stories about all sorts of things. Sometimes the stories were funny, sometimes a bit scary, but they never gave us bad dreams. They never made us afraid nor gave us fears. Grandad’s stories came from words from his mouth, but the pictures were the ones we found for ourselves. They formed from our imaginations and were as colourful and bright or as dim and hazy as our minds wanted them to be. When it came to watching the television our parents were very careful about what we saw. They did not allow us to see scary, nasty or shocking programmes and I’m sure they were right. When the mind sees pictures on the screen, it can be badly affected by those pictures. Unnecessary fears and worries can be created in children’s minds, and even in the minds of many adults. I have listened to many conversations between young people and even adults, when people are discussing their fears. People can develop fears of all sorts of things such as spiders, snakes, birds, heights, open spaces, enclosed spaces and so on. The strange thing is that they seem to love to discuss their fears almost as if they are proud of them, or even attached to them. They do not want to let go of them it seems. Irrational fears can control the lives of some people, preventing them from doing things or going to certain places. They hand over their power to someone else who is then expected to take control of the situation – to move the spider, climb the ladder, or get rid of the bird. When we watch frightening things on television we can begin to think that certain things are dangerous and will harm us. We may have nightmares about them. They start to control our lives. The pictures and situations seem so convincing that they create real fear in us and affect our everyday lives. People can also pick up fear from their parents for no good reason. A mother who is afraid of mice may pass this fear onto her children. My advice would be do not watch horror films, don’t deliberately make yourself scared or uncomfortable. Be at peace, be rational, be calm and realistic. Certainly things can harm us, but the kinds of things that people fear will not normally be harmful at all. To be in control of your emotions is far better than being attached to your fears. That buzz of ‘dread energy’ that you get from fears could be achieved in different ways which are much more useful and constructive. When we challenge ourselves to achieve something and set about achieving it, the buzz that we get from our success will be far more satisfying and long-lasting than any fear induced adrenaline rush.